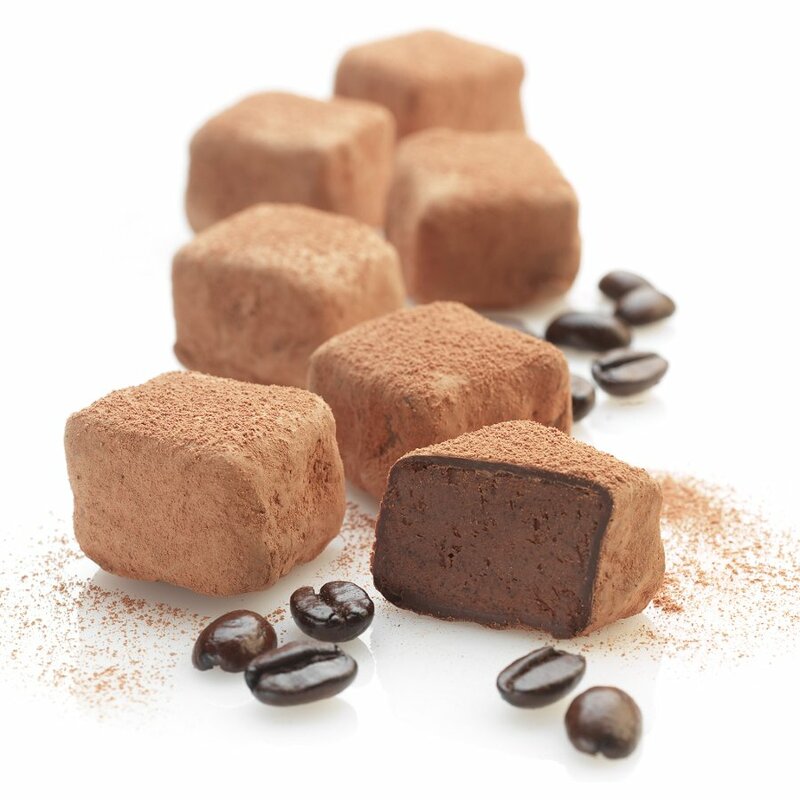 These delicious Booja Booja truffles have been handmade with freshly roasted organic coffee and come presented in their signature wooden box made from 100% renewable poplar wood. 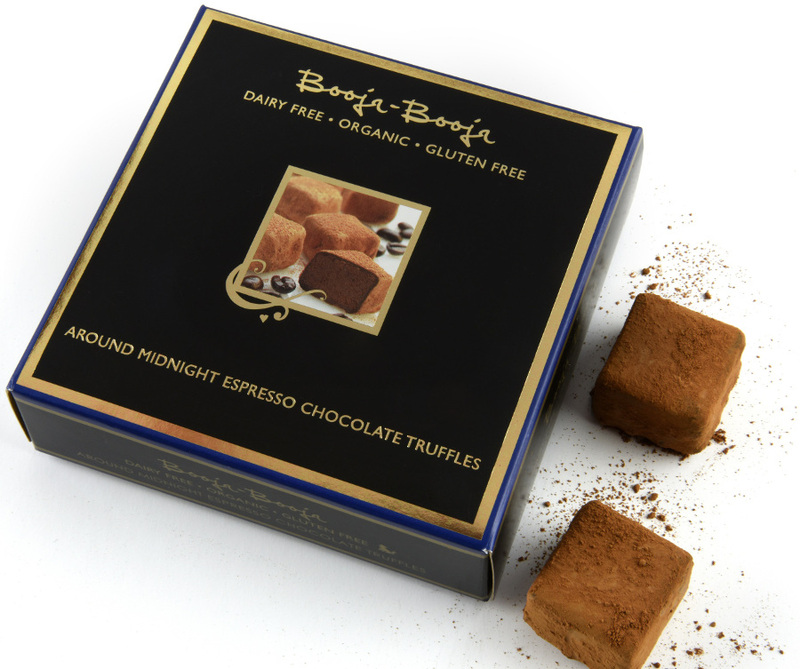 They are 100% organic, gluten, dairy and wheat free, and are suitable for vegans and vegetarians. 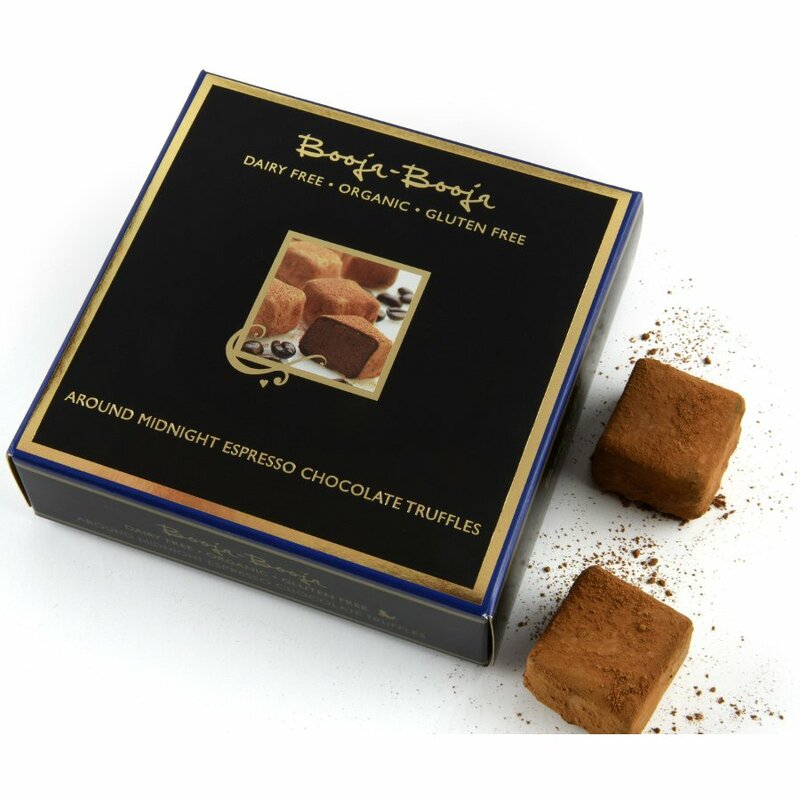 As well as this, they are Non-GMO and have been certified Organic Standard by the Soil Association. 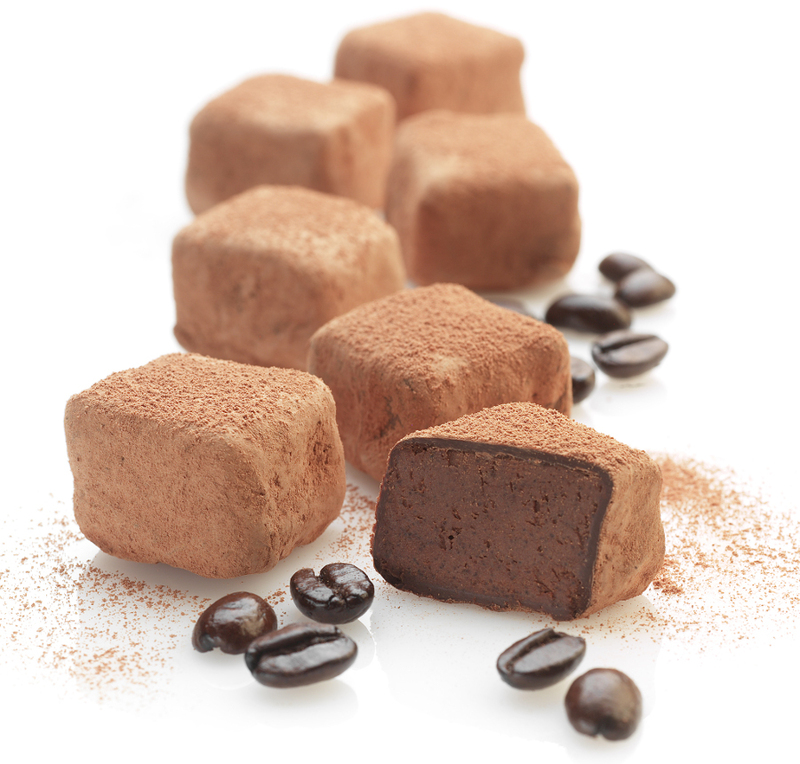 The Around Midnight Espresso Truffles are a unique gift for chocolate lovers everywhere. Booja Booja is an independent trader, as such you will not find this product in the supermarket. 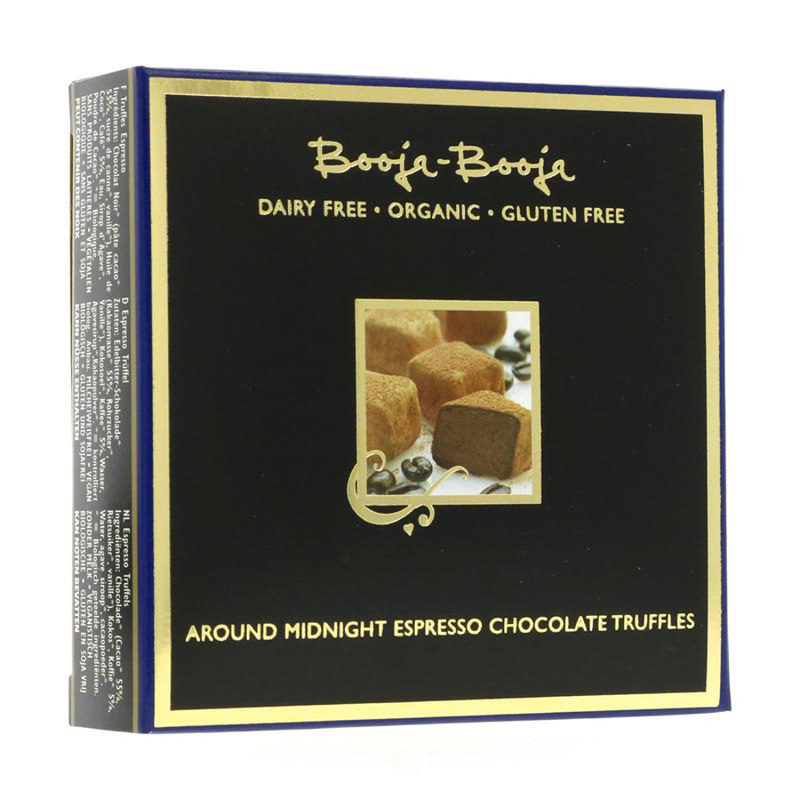 The Booja Booja Around Midnight Espresso Truffles - 104g product ethics are indicated below. To learn more about these product ethics and to see related products, follow the links below. How did Booja Booja get its name?! A: Hi, thanks for your query. I've been in touch with Booja Booja, and this is what they said... "Booja-Booja is fundamentally an experience but it is also the magical, mystical name reflecting the sumptuousness and delight of the experience. Booja-Booja is the balanced healthy pleasure that you experience when you enjoy eating one of Mister Booja-Booja’s creations. A pattern has been emerging over the last few years, a pioneering vision of creating benign and immensely pleasurable, guiltless, indulgences for all to enjoy. The Booja-Booja Company is carving pathways beyond that which modern culture currently considers as fair, ethical and acceptable. It is a constant and happy search to nurture intimacy, balance, love, ecstasy and humour in the world and to participate positively and maximally in helping move the world in that direction through all avenues." I hope this is of interest! Jo.